The importance of including social media in your business marketing marketing plan is sometimes still underestimated. Including social media in your marketing plan is vital, and a should be a no-brainer, especially since most of it can be done on an extremely small budget or even cost nothing but time. Social media websites are among the top ranked websites by search engines. Having links from these high traffic, high page rank websites to your website can add credibility to your site. It is also argued that having a business page on Google+ can boost your placement on Google since it is their social network. This is an extension of the last point – if you are active on a few social networks and you Google your business name, the results are going to all be for your business, because of all of these social profiles. Having all of these profiles come up on the first and second page of search engine results can help ensure that who ever is searching for you will find you. Your business can dominate its own name. You should be on the same field as your customers. Every business has a different target market, and your ideal customers will most likely all be on the same network. Take some time to experiment on a few networks to see where the bulk of your customers spend their time. You can then put your social media efforts into that one network to get the most engagement. 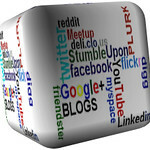 All of your social media efforts should all tie together, which also helps search engines tie them together. Put links on your website to your social media profiles, and link from your social media profile to your website. Also include social sharing on your website(s) so visitors can easily promote you. Another tip is to take advantage of vanity url’s on your social media profiles. Your Facebook page should be facebook.com/yourbizname, the same goes for all other profiles on any network that allows it. If you wait, You may be too late! Get your vanity URL or username now if you haven’t already! The last thing you want is for your name to be unavailable, this will leave you searching for a less memorable name. Full article at Why You Need Social Media, Even if Your Customers Dont.